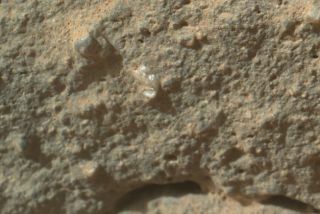 This photo from the Mars rover Curiosity is a close-up of a transparent rock feature that some have dubbed a "flower." Researchers say that its origins are not biological. Image taken Dec. 19, 2012. The so-called Mars "flower" photo was snapped on Dec. 19 by the microscope-like Mars Hand Lens Imager at the end of Curiosity's robotic arm. At the lower left of the image is a strange, apparently transparent formation that some Internet forum users on the website claimed looked much like a flower, according to NBCNews.com's photoblog. NASA posted a raw, unprocessed version of the photo online on the Curiosity rover’s mission website overseen by the agency's Jet Propulsion Laboratory in Pasadena, Calif. Internet forum readers on the website Above Top Secret christened the object a flower, according to NBCNews.com's Alan Boyle. This image shows the full photo from Mars rover Curiosity of a strange transparent feature on a rock, which some have nicknamed a "flower." It appears at lower left. Image taken Dec. 19, 2012. Curiosity has seen bits of clear plastic (pieces of the rover itself) on the surface of Mars before, but NASA officials said that doesn’t appear to be the case this time. On Friday (Jan. 4), NASA also unveiled a new panorama of Curiosity’s current location on Mars, a shallow depression called YellowknifeBayinside the vast Gale Crater. The image is a mosaic of photos that is dominated by a sinewy, snake-like rock winding across its center. NASA scientists have dubbed the rock "Snake River." It is a thin curving line of dark rock that rises above the flatter rocks of its surroundings, making it an intriguing target for Curiosity's instruments, JPL officials said. The sinuous rock feature in the lower center of this mosaic of images recorded by the NASA Mars rover Curiosity is called "Snake River." Image taken Dec. 20, 2012. "It's one piece of the puzzle," rover mission project scientist John Grotzinger, of the California Institute of Technology in Pasadena, said in a statement. "It has a crosscutting relationship to the surrounding rock and appears to have formed after the deposition of the layer that it transects." The $2.5 billion Mars rover Curiosity landed on Aug. 5 to begin a two-year primary mission of determining whether the planet could have once been habitable for primitive microbial life. It is currently driving toward a 3-mile-high (5 kilometers) mountain rising up from the center of its Gale Crater landing site. Curiosity is destined for a point called Glenelg at the base of the Martian peak, which scientists have named MountSharp. But first, mission scientists are looking over Curiosity's images of YellowknifeBay in order to pick a rock target for the rover to use as its first drill site. That drill test is expected soon, JPL officials said. “The area the rover is in looks good for our first drilling target," rover project manager Richard Cook said.